With this week’s release we’re introducing new feature: Credit vouchers. With credit vouchers you can generate codes that will add credit to customer account. This feature gives your business plenty of opportunities! Credit Vouchers can be found in HostBill Admin Area -> Extras -> Promotions -> Credit Vouchers. 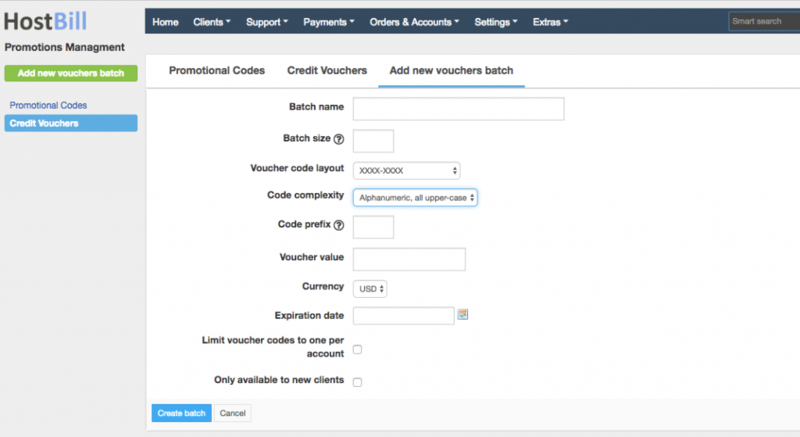 Vouchers are created in batches, that can contain particular number of voucher codes. Each batch can be named to help you easier manage the vouchers – for example ‘Welcome gift’ for new customers. You can specify not only the number of vouchers in the batch but also code layout and complexity (HostBill automatically generate the codes), you can set the voucher value, currency and expiration date. If all the codes in batch are used, you can generate additional codes and add the to the batch. Once the vouchers are created, Credit Vouchers section in your HostBill will display details of each credit batch, number of codes used along with the information about the user and code activation date. 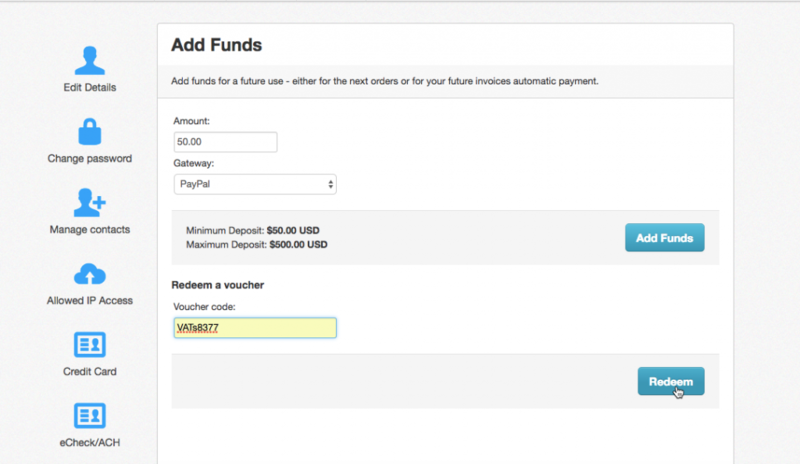 To use the voucher code, the client needs to go to the ‘Add Funds’ section in the client area, enter the code in the relevant field and click on ‘Redeem voucher’ button. If the code is valid, the specified amount will be added to customer account. Attract new customers – credit vouchers can serve as an incentive, to encourage people to buy from your store rather than from your competitors. When you offer credit as a welcome gift for new customers after they register, you will profit twice: you get a registered client who gets additional impulse to purchase from you again! Build store traffic – credit vouchers attract customers to your store, and if you use this opportunity you can get additional profits through upselling. Encourage customers to buy additional items that carry a full profit margin. Use Cart Suggestion plugin or LiveChat module to sell more effectively! Reactivate old customers – it’s easier to sell to your existing customers, who already trust you, to gain new ones. However, a significant number of your customers have probably stopped engaging in sales with you. A credit voucher can be a good reason for them to start buying from you again. Reward customer loyalty – retaining a customer is no easy task. But it’s cheaper and easier than to attract new customers. It’s worth to show a little appreciation to those who stay loyal to your company by offering them a kind of a gift. Upsell – if you want to drive more sales, credit voucher can also be used as a reward for a certain purchase. Set the value for the minimum order value which will qualify the customer to get a credit voucher for later use! Apologize – no matter how hard you try, sometimes things go wrong: you miss the deadline, make customer wait too long or simply make some mistake and you need to apologize to your customer. A successful apology can turn a negative experience into a positive and offering a credit voucher as a form of apology can help you do that. Credit Vouchers feature is free and available to all HostBill users!